Trinity Sunday After the whole cycle of the Pascal Mystery culminating in Pentecost, Mother Church has us ponder and contemplate the utter mystery and essence of God. Revelations demonstrate God in one in three persons; a mystery which defies mathematics. We ask Our Lady, Daughter of the Father, Mother of the Son and Spouse of the Holy Spirit to obtain for each of us the spirit of adoration before the Most Blessed Trinity. Thank you to Mrs Phyllis Cort who runs the Confirmation programme for us every year. Next Sunday - FHC Meeting for Parents: after the 9.30am Mass, Mrs Hogan and Fr Christopher will hold a meeting for the parents. FHC DVD Orders: Please hand back your forms this weekend – to comply with the changes in Data Protection which came into force last Friday, we need a form back from each family regardless of whether you are placing an order or not. UCM Coffee, Cake & Table Top Sale: with raffle too. Next Sunday following the 9.30am & 11am Masses. Eve Salmon RIP: We will hold a memorial Requiem Mass for Eve Salmon on Wednesday 6th June at 12noon. 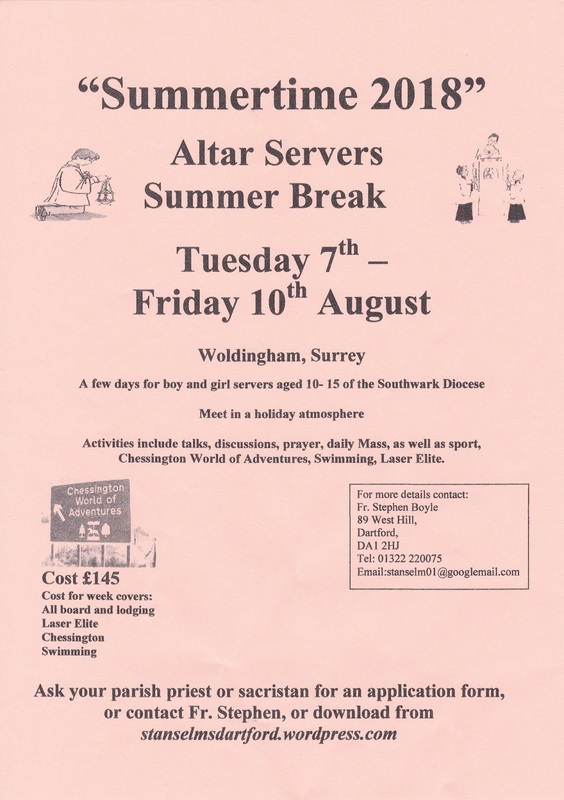 Altar Servers Day Trip: this Wednesday. Please see Fr Chris or Fr Przemek to book your place on the minibus! Happy Half-Term: We wish all our pupils, teachers and staff a happy half-term. We enjoy this week as it gets so quiet & much less traffic!! 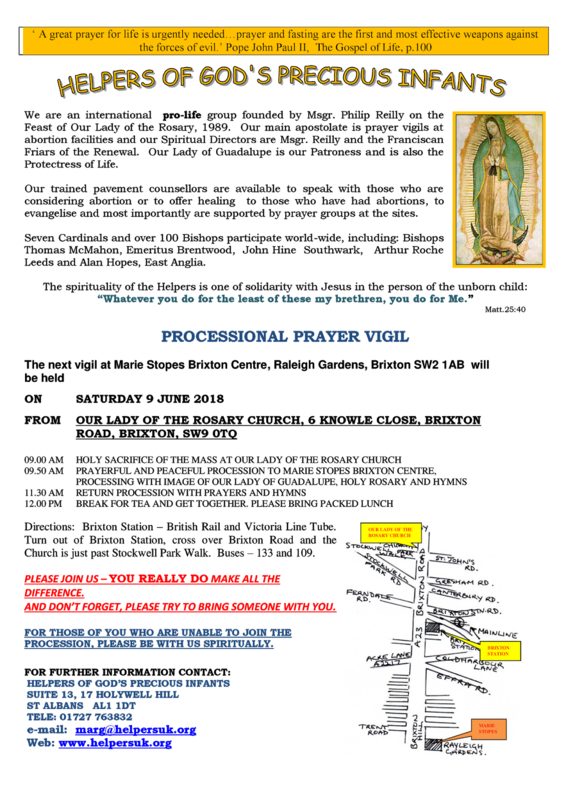 Adoremus: National Eucharistic Pilgrimage and Congress 7th – 9th September in Liverpool. 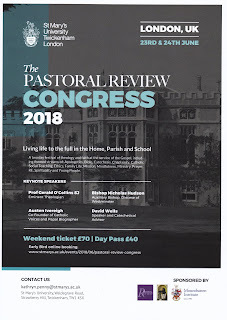 We hope to send two delegates from St Bede’s and we need some youth aged 13 – 20th to go to the youth section on 8th – visit www.adoremusyouth.co.uk. Cleaners This Week: Annie Nongo, Biannie Bilwala, Mamie Bazakana & Chinwe Uwalaka. London SW Catholic Young Adults is a social group for young Catholics which meets every month. For further details visit our Facebook page or contact Miles on 07790 441242. Our next social evening is on Saturday, 2nd June at 7.00pm at Noor Jahan, Sutton SM2 5BQ. 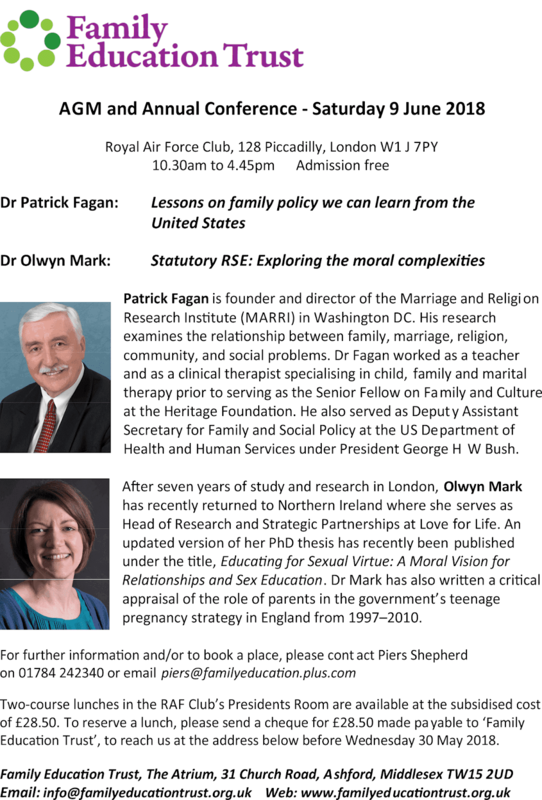 Family Education Trust Conference: Saturday 9th June at Royal Air Force Club in Piccadilly. 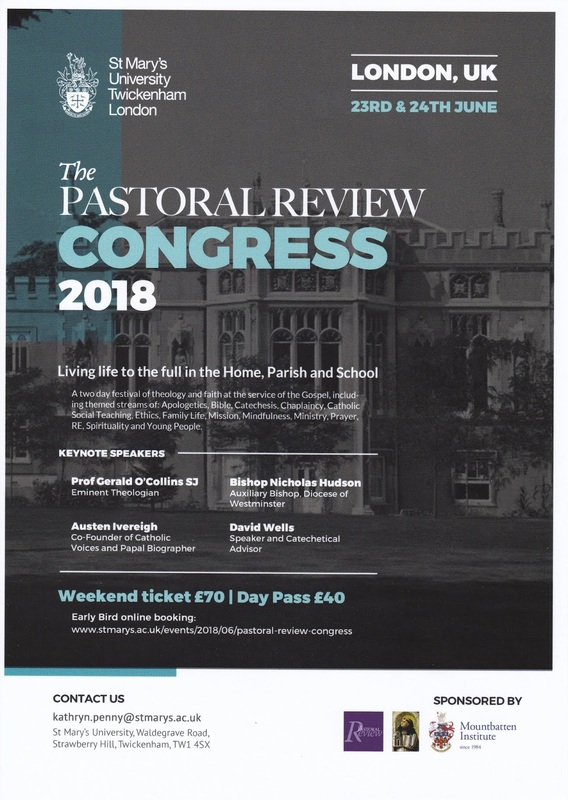 This year we will be hearing two very distinguished speakers: Dr Patrick Fagan of the Marriage & Religion Research Institute and Dr Olwyn Mark of Love for Life Northern Ireland. 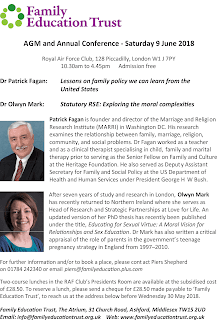 Dr Fagan is making a rare visit to the UK from USA and this is a great opportunity for people to hear one of the world's leading defenders of traditional marriage and family. See the poster for details and booking forms are available from the table in the porch. Helpers of God's Precious Infants: The next processional prayer vigil will take place on Saturday 9th June at Brixton (Our Lady of the Holy Rosary).